The recently renovated Petit Palais, situated near the prestigious Avenue des Champs-Elysées, houses some 1,300 works of art from the Antiquity through the early 20th century. This under-appreciated collection, which tourists frequently overlook simply because they've never heard of it, boasts masterpieces by artists including Gustave Courbet, Paul Cézanne, Claude Monet and Eugene Delacroix. Inaugurated in 1900 for the World Exhibition of the same year and presented in tandem with the neighboring Grand Palais, the "petit" counterpart is a striking example of art nouveau architecture and one of the city's crown jewels from the turn-of-the century era known as the "Belle Epoque". Wrought iron entrance gates and decorative ceiling elements, elaborate cupolas and colorful murals give the space the grandeur of a true palace. The museum of fine arts only moved into the building in 1902. As part of a large network of municipal museums, all visitors can access the permanent collection at the Petit Palais free of charge. Meanwhile, temporary exhibits held here explore trends in modern art, photography and other mediums. If you have a hard time deciding whether to focus your time on classical or modern art and once you've seen most of Paris' top 10 museums, this humble gem of a collection should definitely be on your radar. The museum (permanent and temporary exhibits included) is open to visitors every day except Mondays and public holidays, from 10:00 am to 6:00 pm. The ticket office closes at 5:00 p.m, so make sure to arrive at least a few minutes before to ensure you get in and avoid disappointment. Closing Days and Times: The museum is closed on Mondays and on January 1st, May 1st and December 25th. Admission to the permanent collection at the Petit Palais is free for all. For information on current admission prices and discounts to temporary exhibits, consult this page at the official website. The Petit Palais regularly hosts temporary exhibits that explore modern art, photography and even fashion. The museum has hosted in recent years exhibits such as a widely admired tribute to the fashion of French designer Yves Saint Laurent. Visit this page for a list of current temporary exhibits at the museum. The permanent collection at the Petit Palais has been amassed over the course of the museum's long history, with works donated from private and state collections. Paintings, sculptures, and other mediums from Ancient Greece through the early 20th century make up the collection's more than 1,300 works. Main wings in the permanent collection include The Classical World, featuring major Roman artworks from the 4th to 1st century BC as well as precious artifacts from ancient Greece and the Etruscan empire; the Renaissance, boasting objects of art, paintings, furniture and books dating from the 15th to 17th century and hailing from France, Northern Europe, Italy and the Islamic World; sections concentrating on Western and European art from the 17th through the 19th centuries and Paris 1900, focusing on the sumptuous art nouveau movement and featuring stunning paintings, glasswork, sculptures, jewelry and other mediums. 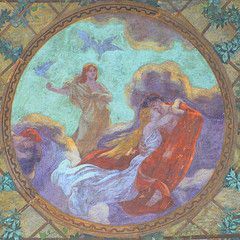 Featured artists in this last section include the likes of Gustave Doré, Eugene Delacroix, Pierre Bonnard, Cézanne, Maillol, Rodin, Renoir, crystal makers Baccarat and Lalique, and many more. For complete details on works in the permanent collection, visit this page.